Finally, the temple and its setting are beautiful, and the story of the Tripitaka Koreana fascinating. We were told the carved blocks weigh 280 tons and took 16 years to create, a project undertaken in the 13ththentury during the Mongolian occupation of Korea as part of the effort — the spiritual part, that is — to expel them. For about two hours, Do Moo Zee was our tour guide on a circuit that included a quick visit inside the Tripitaka Koreana storehouse. 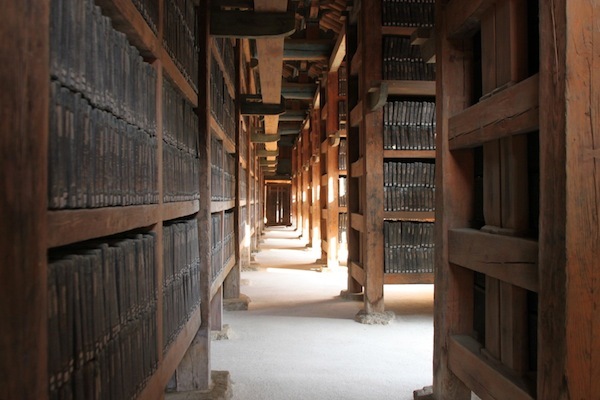 A fraction of the thousands of wooden blocks that comprise the Tripitaka Koreana seen in storage at Haeinsa. The exteriors, and often the interiors, of Haeinsa buildings are brightly painted. 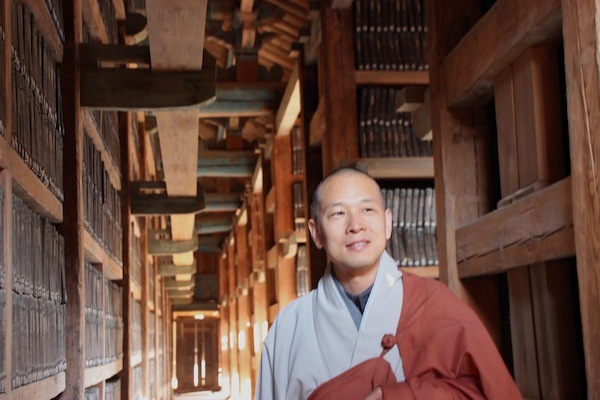 However, the monks’ residences have no bright colors, and the 15th century wooden buildings housing the Tripitaka Koreana, which were once painted, have not been repainted because of the potential for damage to the wooden blocks inside. This collection, which has now been digitized, is part of the UNESCO World Cultural Heritage and a major tourist attraction in Korea. A Haeinsa monk acts as host to outsiders viewing a portion of the wooden blocks that comprise the Tripitaka Koreana. I loved the setting at an elevation a bit above most of Haeinsa’s buildings where the Tripitaka Koreana is stored. It seemed an appropriately still and subdued place for looking 800 years into the past. But for us, suddenly, everything shifted to the present, in time for a prompt departure. As I was bowing my farewell to Do Moo Zee, who had generally relied on an interpreter, he told me in English that I reminded him of his mother. This article and its photos are by Nadine Godwin, the author of Travia: The Ultimate Book of Travel Trivia, which was published by The Intrepid Traveler. Korean temple stays can be booked at http://eng.templestay.com.